Phantasy Star Online Episode III: C.A.R.D. Revolution is a video game released for the Nintendo GameCube. 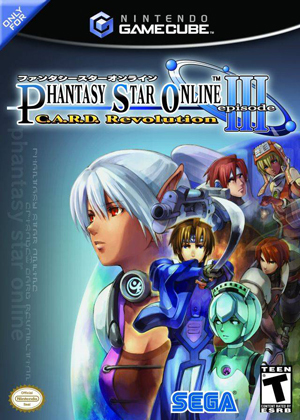 It has a card based play style, making it unique among games in the Phantasy Star Online series. The story of the game takes place twenty-one years after Episodes I and II. Syncing the calendar causes the game to crash. Despite what the game indicates when first run, one can play the game normally without the calendar; so when prompted to sync it at the beginning of the game, simply select "no" to proceed. FMV cutscenes such as the intro on creating a new commander appear black unless the External Frame Buffer is enabled and set to Real and Scaled EFB Copy is disabled. Setting the Internal Resolution to 1x reduces image shaking. Note that more recent versions make the rest of the game look choppy if you keep the above two settings on, so it is advised to only have them on if you must see the FMVs in game. The graph below charts the compatibility with Phantasy Star Online Episode III: C.A.R.D. Revolution since Dolphin's 2.0 release, listing revisions only where a compatibility change occurred. 3.0-432 Windows Server 2008 R2 AMD Athlon II x2 @ 3.4GHz AMD Radeon HD 6570 Steady 30FPS, no problems with x2 native resolution. This page was last edited on 24 January 2018, at 03:59.